The progress of religion towards post-theism has its critics on either side, with devoted theists decrying it as just another form of atheism, and atheists voicing their suspicion that it’s taking us backwards into superstition and tribalism when we need to be moving forward into the enlightenment of science and technology. Theists are sure that the “post” in post-theism is motivated out of a desire to get rid of god, to get past our need for what god represents and provides. On the other side, atheists hear “theism” in post-theism and are convinced that it’s nothing more than a postmodern reconstruction of the same old neurosis. 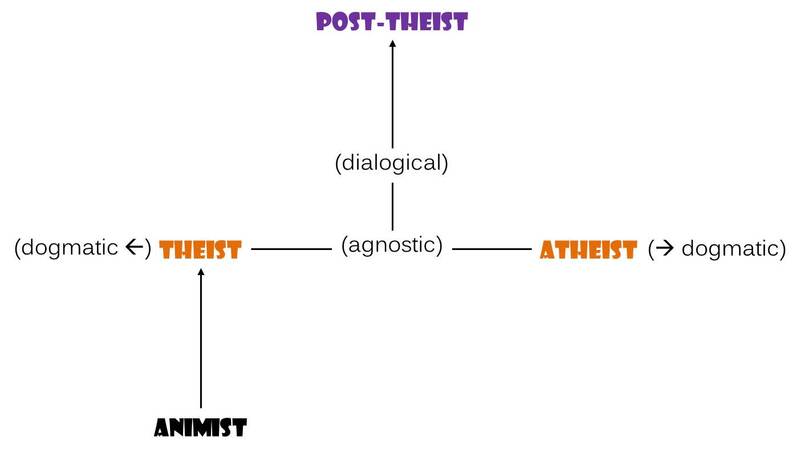 But the “post” and “theism” in post-theism are misunderstood in each case. In fact, post-theism represents the direction religion must go – indeed it’s the direction that religion is already going, despite the slide at its margins into the corruptions of complacency and terrorism. You might be surprised to learn that you are a post-theist, but I make no presumptions. Religion began in the body, where the visceral urgencies of our animal life resonate with and link into (religare means to connect) the rhythms of nature. Earliest religion was animistic, preoccupied with the provident support of reality and the life-force that ebbs and flows along the rhythmic cycles of natural time. The pressing concern was to live in accord with these cycles, to flourish in the fertile grooves of dependency and to celebrate the mystery, both tremendous and fascinating (Rudolph Otto’s mysterium tremendum et fascinans), in which we exist. There were no “gods” as yet, no external causes or agencies behind the forces impinging on us. The thunderstorm, for instance, wasn’t regarded as controlled or sent by some supervising intelligence separate from the storm. Rather the thunderstorm was itself the violent and refreshing expression of life-force. Its power manifested a vital energy and aroused sympathetic vibrations in our nervous system. As time went on and the smaller family clans of our early human ancestors grew larger and more socially complex, this new cultural environment of the tribe gradually eclipsed a direct relationship with nature. In order for the individual to become a compliant member of the group, animal urgencies of the body had to be “trained” into morally acceptable behavior as befit the tribal order. The social construction of identity thus domesticated our animal nature and installed a deputy manager in the ego, with the authority of executive management retained by the tribe. It was probably the question of “who’s in charge” – as key to the smooth operation of social roles and duties – that first inspired a reconsideration of nature as managed by external agencies, giving rise to the notion of deities as supervising directors behind what is happening around us. Conceiving a sovereign intelligence “on the other side” of our limiting conditions transformed the human-nature relationship into an exchange of services. As human devotees offered their prayers, worship, and sacrifices to a patron deity, it was hoped that the deity would in turn grant success in childbirth, a bountiful harvest, victory over an enemy, comfort in suffering, beatitude in the next life, or whatever boon was under the deity’s control and discretion. Somewhere along the line, someone called “B.S.” and the game changed. The denial of (a) god’s existence might have been a simple refusal to accept the reality of something unavailable to direct experience. It may have come as science was starting to penetrate the veil of what’s really behind the phenomena of nature. Or perhaps it was provoked by the confrontation of a divine will and humane values, as ethical defiance of a deity’s demand for child sacrifice, for instance. Then again, our First Atheist may have simply been unable, with intellectual integrity, to accept the popular personification or orthodox theory of god. The moment someone publicly said “No” to (this or that idea of) god, theism became an option and people had to choose between believing or not believing – that is, between taking the traditional myths and doctrines literally, or dismissing them as bunk and balderdash. Due to the morally charged nature of the tribe, and of the individual’s identity as a member of the tribe, this polarity of options quickly collapsed into a conflict of opposing views. Inevitably, it seems, theists and atheists are compelled by force of their differing convictions into dogmatic positions, each refusing to listen to the other and both fantasizing a world where the other no longer exists. The rise of post-theism begins right here, in the tension generated between the poles of theism and atheism. It’s important to understand that post-theism is not merely a marketing makeover of theism, nor is it a postmodern restatement of atheism. And even though the dogmatists on both sides cannot (will not) acknowledge post-theism as a viable “third option,” there is a growing number of both theists and atheists who are creatively promoting its advance. This is because more contemporary thinking individuals are coming around to the realization that, one way or the other, we really just don’t know. 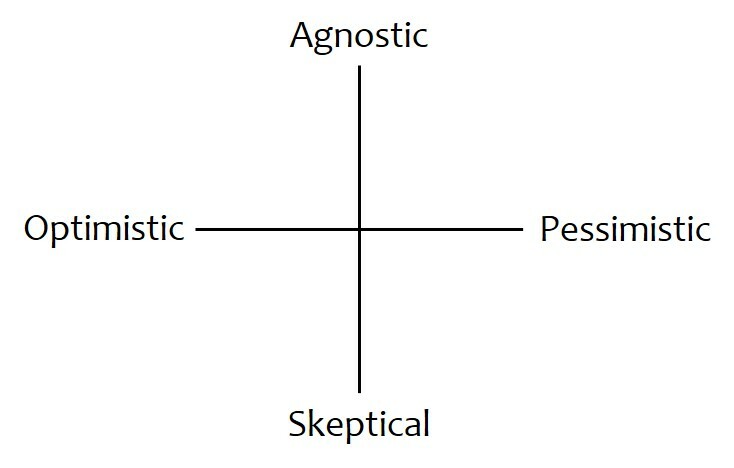 Between the dogmatic positions on either side of the theist-atheist debate, a significant population of truth-seekers around the planet and across cultures are finding space to breathe, as they acknowledge that the grounding mystery of being, which the myths and metaphors of religion attempt to name, is beyond language and the grasp of our minds. To say that it does or doesn’t exist in the guise of one deity or another is to miss the real insight of this agnostic confession. The point is that all our attempts to talk about it, as part of an effort to prove or disprove its objective existence, move us out and away from the very truth we are contemplating. Post-theism begins, then, as theists and atheists alike humbly admit that the Real Presence of mystery (or the present mystery of reality, including, of course, the reality of our own existence) is ineffable – incapable of being described in words or reduced to meaning. Any honest thinking person cannot dismiss the awareness that language and the meaning we construct only qualifies this mystery, but will never contain it. For that reason we must renounce the tendency in ourselves towards dogmatism, and leave open a “space” in our belief systems for a deep, silent wonder. Fighting over the existence of god is thus a contest over meaning that gets us no closer to the grounding mystery and provident uplift of life in this moment. Whether theist or atheist, each of us needs to descend through that open space and ponder the umbilical opening where meaning crystallizes and dissolves again into the mystery. Obviously this requires us to be sufficiently centered and self-aware, as well as contemplatively engaged in the moment. If you and I can both speak out of that agnostic space of not-knowing, offering our perspectives and beliefs in a spirit of humility, the Great Work of religion can proceed. The theist-atheist debate is a win-lose contest (and all too quickly becomes a war). Dialogue, on the other hand, is this activity of sharing our perspective without a need to persuade or convince a dialogue partner to our position. We speak and listen with openness, curiosity, respect, and in a mutual understanding of the necessary incompleteness (and possible distortions) in our relative points of view. Through the back-and-forth of dialogue, meaning (logos) forms between (dia) the partners. It is no longer merely a reciprocal sharing but becomes a mutual co-creation of higher meaning. With my illustration now complete, what I’m calling the “Great Work” of religion approaches fulfillment. With its commitment to keeping an open space of agnostic confession and enjoining other perspectives in healthy dialogue, post-theism takes up the responsibility of constructing shared meaning. This constructivist phase is where the providential uplift of the grounding mystery, experienced in the mystical depths of contemplative awareness, finally bears fruit in a paradoxical vision: The truth of both/and honors our differences as it energizes the ongoing pursuit of inclusive community. Note: The color-code of text in my diagram corresponds to that in previous posts.